I think that I’ve been abused for so long that I don’t know how to be happy or healthy. From birth there has been violence in my life – such is the curse of being a child in a domestically violent home. Certain messages get stuck with you for life. I’m going through a particularly bad phase of my mental health right now. I’m seeing dirt in my dreams, I can’t line up the unorganized patterns on my walls, I can’t get the dust and cobwebs vanquished from my home. My house is not clean – I’m not one of those “fortunate” OCD types. My brain keeps going and going. I visualize every possession, every square inch of my home in my head and my mind imagines all the different creavases that dirt can hide, that bugs could hide. I think if I actually found a bug in my home I would not sleep for days because I would need to tear everything apart and throughoughly detail the entire home. back to the visualization. ticking away is an ever mounting to – do list of how it needs to be done. counting each item in my head. graphing out each room on graph paper – to scale. one square to each inch in my home. if i mess up i start over. it takes more than one sheet of graph paper to chart out a whole room. i carefully tape each page together. the lines have to line up. if i mess up i start over. pen in the windows, the doors. measure out the arc of the door. try to figure out how to convince my husband that we need to remove doors and get rid of them – they block escapes and take up too much room. have to do it in pen. pencil leaves smudges and then my hands get dirty. can’t function if my hands get dirty. can’t continue if my hands are dirty. can’t touch anything until my hands get clean because i can’t make anything else dirty. if i mess up because i used pen instead of pencil i start over. room is graphed. onto furniture. lost in thought, how to measure plush furniture. how to measure the rocking chair? it’s not square or rectangle. the recliners – have to measure them open and allow for that space to be in consideration. it doesn’t line up – there’s not enough space. graph out furniture. carefully glue furniture onto cardstock. cut around furniture pieces. exactly 1/2 block border around each piece of furniture. if i mess up i start over. space is important – been told repeatedly when I was younger that I take up too much space. space is essential. I take up too much space. my stuff takes up too much space. how can I be comfortable? with all this space taken up? When I was younger I read this article about this girl – everything she owned fit into a large box plus her futon. only keep what you find to be important, what you use, what makes you happy. I remember that one of her items was a bottle of glittery nail polish. At this point I was already on my way to becoming a hoarder. FREEDOM! my very young brain shouted to me! Freedom from too much space being taken up. stuff was packed under my bed, in my closets, my drawers, everywhere. none of it was particularly valuable but I had to keep it. Freedom from the chaos around me. I excitedly told my mom about the article I had read – she promptly stated the article was stupid and who would want to live like that. right then and there my need for space was shot down and I was called stupid yet again. disposing of items was particularly hard many times in my life – when I was young money was spent on alcohol and cigarettes instead of paying the monthly garbage bill. the need to keep, to hold on to, in case we may need it was very strong in my mother. She was married to my father – the abusive, self-centered jerk who thought little of his family. He squandered away his paychecks on cigarettes, booze, fishing lures and magazines. his lunch pail hosted an array of foods while the 5 of us split one package of ramen noodle soup. thankfully we had chickens who ranged free surviving somehow because dad surely didn’t spend money on grain for them. thankfully we had a daily supply of eggs to keep us nourished and somewhat regular trips to the food pantry when it was held at our church because money was tight. like I said, hoarding runs strong in these bones. my grandmother is a hoarder – there were always piles everywhere. her sheds packed full, closets full, table, drawers, nooks and crannies full. my other grandmother a hoarder. They filled one home to the brim so they bought another. When my grandfather died, they barely could get to him. the hoarding was so bad that they removed my grandmother and condemned the home. their plumbing didn’t work and they couldn’t bring a plumber in because of the STUFF, the garbage. My aunt is a hoarder – her home was so full that she couldn’t get the in-home health aide that she so desparately needed. she almost died in that apartment. When she was in the hospital my mom had to go in and clean out. bag after bag after bag of garbage. it was the only choice. she was in danger of losing her subsidized apartment. boxes and boxes of items that never seen the light of day, reaking of cat piss and water damage. piles on piles on piles everywhere. empty mayonaise jars, enough pasta for a family for years. so much stuff. the apartment always reaked. not only did her stuff take up so much room but she takes up so much room. largely obese – she is my biggest fear. if i don’t start taking care of myself and breaking my hoarding tendancies, breaking my eating compulsions, getting healthy i will be her when I’m older. my brother gets so paralized when going through his things that when I see his stuff it looks like garbage mixed in with important stuff. The garbage ruins the good stuff eventually turning it all to bad stuff. my mom would take everything I would ever try to get rid of or at the very least try and usually succeed at convincing me that I needed to keep everything that I have ever wanted to get rid of. I never could get rid of anything because she would never let me. but she always would tell me how much SPACE I was taking up. I moved into this home – i broke down crying when we walked in. we had rented a large moving truck to make the move up. we moved into the “family” house. I was told that it would be ready for us to take it over. We walked into a dusty, dirty, cat pee smelling home full of STUFF. everyone’s stuff. every room full of STUFF. i sat on the toilet with the door locked crying for a long, long time. it had been a long drive and we were going on very little sleep. outside was a giant truck full of too much stuff that needed to fit inside a house with too much stuff that had a shed already full of too much stuff. Can i get rid of this? no, can i get rid of that? no. what about these 3 coffee makers? they are still good, you can use them. But I have a coffee pot that I love. that might break someday and then you will need a new one and these ones work just fine. almost two years to the date later and the home still has items that were left behind. back to the graphs – many hours later and the graphs are finished. a trash bag is full of the errors. I lay the graphed room on the table and put the furniture in place where they currently are. I try to move them around, make it fit better to give me more space. as hard as I try to make it work it doesn’t fit better. there is just too much stuff. try to get the husband to help and he says he’ll help me with it later. i say it’s always later, why not now. it doesn’t get done. it doesn’t fit. I don’t have enough SPACE to breathe, to move, to be happy. the walls are closing in on my, there are too many nooks and crannies and my brain is hurting thinking about all the dirt that is hiding everywhere. Okay – I just need to get rid of some stuff. how about some books. pull them all down off the shelves. carefully dust each one. clean each shelf. wash hands to clean hands. sit back down. carefully flip through each page of each book. i tend to stash things places. i don’t want to unwittingly give/ throw away something important. set book down, repeat. start piles. one pile for keep, one pile for giveaway. keep gets taller and taller and barely anything gets put in the giveaway. i might read it again someday. i might need to reference it. 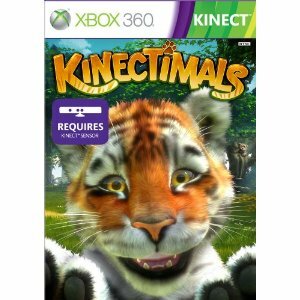 i may start training others again. my daughter may want it someday. i can’t part with that yet, i haven’t read it. i can’t believe that i spent so much money on books when we are in debt. i can’t part with it because then I’ve truely wasted our money. office supplies – try to purge and wind up c reating a wish list of supplies “needed”. craft supplies – look at all the unused craft supplies and start berating myself for not crafting more. also convince myself that I need to keep all the crafting supplies because I’m going to start crafting again and then my daughter will want to craft too and I will just be wasting money if I get rid of it. vow to self to craft. scrapbooking supplies – become instantly overwhelmed at the amount of supplies and start to berate myself for having so few pages completed. vow to self to scrapbook. nevermind the fact that scrapbook is much like the graphing. mess up, start over. over and over and over again. in the time it took my to scrap one page someone else could have 20 completed. last summer I tried a medication for the OCD. it worked like a breathe of fresh air (only not unpleasant) but I quickly stopped it because of the immense sweating. in that short time however my possessions lost their hold on me and I started purging. out went my wedding dress, books, extras and more. I was always so embarassed to have people come over because everyone always said, you have a lot of stuff. ouch. even my mom uttered those words multiple times even though so much remained that was once hers. if you have been following this blog you know that I am leading up to a yard sale. I’ve been sorting and pricing and stashing in the shed. I just realized that I’m ready to part with more. why is this so important? I can’t think straight. all i can think about is the stuff. I’m learning that once I free the stuff from my home I no longer worry about it. I feel lighter, freer. It hurts me to look at all of the stuff. patterned items especially. too much visual stimulation. Most of the scrapbooking supplies are leaving with this sale – never to return to my home. as is the sewing machine and much of the crafting supplies. I realized that I’ve built up these fantasy selves – I’ve never particularly liked myself so always dreamed I would cultivate all these skills and would be AMAZING and people would love me and want to be around me. I realized I don’t need those skills to be loved. I do have a select few people who do want to be around me. I don’t need those things to create an identify for myself. so what if I’m not a scrapbooker, or a crafter, or a writer, or a journalist, or a fantastic cook, or an amazing housekeeper. I don’t need to be and I can let those things go. I also hate dust and hate to dust. why keep a whole bunch of stuff that requires me to dust them? it’s so much easier to dust 3 or 4 pieces or a flat empty surface than to dust hundreds of items. Am I ever going to be fluent in 20 different languages? no. fluent in spanish? no. enjoy the occasional french movie? of course – oui:) the nature adventure books? I don’t even like being outside. out you go. haha. can I drop these expectations of myself and just allow myself to be as I am? I’m definately going to try. back to the obsessively clean part – my house is not obsessively clean unfortunately. I wish it were. By the time I’ve mentally mapped out my home, then graphed out my home and then dusted my bookshelf and flipped all the pages I’m exhausted. or maybe i tackled the game shelf and counted all the pieces to all of the games. Long message short – I take up too much space, my stuff takes up too much space, i will never live up to the expectations that i’ve given to myself. fix? – get rid of all the stuff that does not truly reflect me – but the rather fantasy version of me, practice self-acceptance and create a space that makes me feel at home. Is having OCD really so bad? I think OCD can be fun sometimes – if you consider counting fun. 1, 2, 3, 4, 5, 6, 7, 8 – holding each set of 8 in my hand – counting the first four, counting the second four and then counting them together. Lovely tracing my finger over the pattern. 8 knives, 8 big spoons, 8 small spoons, 8 big forks, 7 small forks – wait a minute – 7???? can there really only be 7? There is one missing. There is supposed to be 8. Dumped the drawers – it must have been misplaced. not there. must be dirty, has to be dirty. washed all the dishes. not there. maybe it’s in the living room. checked all the surfaces. not there. must have fallen on the floor. nope. behind the furniture – flipped over all of the furniture and took about the backs of the chairs. nope. we don’t eat in the bedroom but it must be there, has to be there. looked on the dressers, flipped over the mattresses, moved the dressers. nope, nope and nope. 7 how can there be only seven. I must have miscounted. There is no way that I could have possibly lost one of my beautiful small forks. Not the beautiful fork that I had so lovingly picked out and brought into our home – a grown up set – not a cheap set purchased because we NEEDED a fork to eat with. It was our hard earned yard sale earnings set. We parted with our possessions and sat in the sun for hours for this missing fork. I couldn’t have lost it. 1, 2, 3, 4, 5, 6, 7. Still 7. Recounted the others. 8 of the rest but 7 of the small forks. Convinced that I didn’t look hard enough I repeated ALL of the above. probably two more times. maybe 3. Now this was several weeks ago and there are still only 7 forks. I’ve considered buying the set again and taking just 1 fork out and donating the rest but I’m trying not to allow myself to do this. I believe I can live with only 7 but some days are hard. I keep counting – magically hoping that one day the 7 will turn into an 8. My husband believes that it must have been accidently thrown away. It’s possible but I don’t want to think long on that because I don’t want to return to that place – the bad place, the repeatedly checking the garbage place where garbage had to be inspected multiple times to ensure that something valuable wasn’t thrown away. no one should be in THAT place. I’ve gotten better – I honestly couldn’t tell you how many plates or cups I own at the moment. That’s a plus. They are also not even and I don’t lose sleep over it so that is a plus as well. I remember breaking a small plate once and having to purge a bowl and large plate just so the numbers were the same. used to count those too – daily. It’s hard though. If the counting goes away, the fears go away, the anxiety goes away, the collecting and hoarding and handwashing and STUCKNESS goes away what is left? I’ve been stuck in the OCD mindset for so long that I don’t know who I am without my obsessions and compulsions. This journey towards happiness is a self-discovery journey – a find me in the process journey. All that stuff doesn’t make me happy, it just boxes me in and makes me frantic. This journey has led me to a new joy and most importantly hope. Several days ago I purposely got a bit dirty and a bit wet when I planted 4 containers with seeds. The dill and oregano have been growing. The lemon basil is looking strong and the others may be peaking out anytime now. Everyday when I look at these plants I’m reminded that I stepped out of my comfort zone and something beautiful has taken root. Another day pushing my boundaries with the OCD. I originally wrote “my” OCD but I do not want to take ownership of it because it’s not mine. I am not an OCD person but a person who struggles with OCD. If you identify yourself by your disability then it almost feels like your giving up hope that life could be better. On the weekends my husband quietly comes home as not to wake up either of us if we are sleeping. It’s so sweet because he knows that I never get to sleep in as my daughter is normally an early riser. No matter how quiet my husband is though I always wake up shortly after he arrives. It’s hard being on a different sleep schedule than him. We’ve been together 11 years and have always gone to bed at the same time unless one of us have been sick. 11 years sleeping by his side and to suddenly have that gone has been difficult. The job change was for good reasons but change is hard even when it’s for good reasons. I knew today was going to be rough right from the start. He was sitting watching DS9 while simultaneously playing Civilization on the computer but looked up and smiled when I came out of the bedroom. I asked him how his night went and decided to fold the clean clothes that were sitting in the living room. Our daughter woke up shortly after. “Did you know tomorrow’s Easter? That’s makes today Easter EVE!” she says in a (can’t contain the excitement) hyper tone of voice. “The easter bunny is going to come and I’m going to rush right out and run into the kitchen and swoop up my basket into my arms and grab all the toys and candy!” she continues. “Do you think the easter bunny is going to hide eggs? or just at Grandmom’s and how does he know I’m going to be at Grandmom’s anyway? do you think she sent him a letter? OH NO! I forgot to write him a letter! I better do that today! I’m so EXCITED about EASTER! Did you know tomorrow’s Easter! I CAN’T WAIT!!!!! !” Everyday this week and a good part of last week she’s been talking about easter. She has been practicing hiding eggs and searching for them for practice. She has been dressing up as a bunny and dancing for her “Easter Show!”. She’s has been rearranging the easter decorations here, there and everywhere in the house. She’s been playing easter music and playing with her easter toys and talking about easter. She recounts in detail Easters past. She jumps (only slightly exaggerated) into my lap to make sure I can hear her and so she can smother me with hugs and kisses. At this point my hands are shaking and the pain is starting in my head and I think my eye is even twitching a bit. “I can do this.” I calmly tell myself. But it’s all too much. I ask my husband to pause the TV and I stop folding clothes. He mutes the music on his game and I give her my full attention and have the easter conversation with her. Repeat this two more times during the 45 minute episode. What’s so special about Easter? you may be asking at this point. It’s a holiday. She’s already planning Mother’s Day – all I know is that it involves a video camera and something special for me. She is already talking about all of the previous Mother’s days. She reminds me of the gifts she made last year for me. Valentine’s blended into Saint Patrick’s Day which blended into Easter. There is always something that she is SOOOO EXCITED about that she cannot stop talking about. Then she remembers that she has watermelon and boiled eggs in the fridge. She rambles on about how much she loves watermelon and begs to have it and one of her dyed eggs for breakfast. A moment’s peace while she chomps down on her melon and carefully peels the shell off her egg. She then comes in and tells me she’s eating a baby chicken. I proceed to have a conversation with her about how female chickens lay about 1 egg a day and that unless there is a boy chicken around the egg will never be a baby chicken so she is eating an egg, not a baby chicken. She then starts asking how boy chickens turn the eggs into baby chickens and I talk about fertilizing the eggs. My daughter had an appointment with her therapist today. It takes about 45 minutes to get there so we always try to plan other things while we are in the area. It was at such a bad time – 11am – right in the middle of when my husband should be sleeping. I offered to take her by myself but her mental health is important to both of us and he wanted to go (I love him by the way). When he suggested we head up early and go to IHOP the two of us were still in our pjs. My daughter and I quickly raced to get dressed – she won of course. She packed a quick bag of items she wanted to bring to therapy – play therapy is the best for younger children! The waitress brought out our drinks. My daughter ordered the blueberry lemonade splash – it didn’t come out in a kid’s cup but a tall glass with a spoon, lemon wedge, blueberries and lots of ice. no straw might I add. fingers plunged into the drink. spoon scooping out ice, blueberries. she is slurping out of the cup and saying, “look mom – no hands” as she leaned over the table so she didn’t have to pick up the glass. My eggs were luke warm, the hash browns cold, coffee sloshed over the side of the cup, the table slightly sticky. I forgot to tell the waitress no sugar please on top of my pancakes. I did tell her not to put it on my husband’s but she forgot. The pancakes though? a little taste of heaven. Really working hard not to complain to my family. The coffee was delicious so I focused on that. and chatted with my husband and smiled – forced as it may be today I smiled none the less. Hands shaking so bad I can barely sign the slip when paying. My husband asked what was wrong but he already knew – I was in the middle of a panic attack. We sit in the car for a moment. I take one of my pills and wait for the anxiety to finally peak and then subside. Then I head out to her appointment but my husband notices that we still have over a half hour to spare. He suggested that we go to the pet store. I said that we could go if he didn’t mind me sitting outside while he takes her in. He stated that he didn’t want to go in without me so we could go to the pet store another time. My daughter was in the backseat saying, “I want to see the dogs!” I said that I just couldn’t do it today and he assured me that it was okay and we didn’t have to go. I don’t know what made me change my mind but I pulled a u-turn and headed to the pet store. We petted the puppies, she was loving how they followed her around. My hands typically are shoved into my pockets or tucked close to me. I went up the the petting area and reached on it. One licked my hands, another nibbled. One particularly feisty puppy grabbed onto my coat sleeve and wouldn’t let go. I was able to laugh with my daughter and enjoy the puppies (something I’m not typically able to do). We look at the rabbits for awhile then the other animals but ultimately end back with the puppies. I found this wonderful little gem of a book last night while browsing through Amazon’s kindle store. I’m always skeptical of anything cheap (but I love a bargain of course) and this book was priced at $0.99. I started reading through the preview and before I knew it I was out of pages and completely hooked. I bought it and immediately put it on my ereader. easy to read, useful advice, down to earth and completely doable. 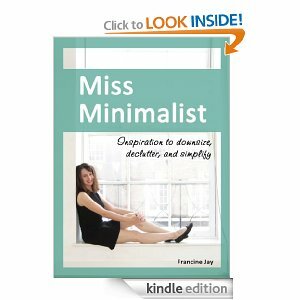 I will never be a minimalist but I can relate to her and use her musings to help create my home sanctuary. I think what attracts me the most to a minimalist lifestyle is the simplicity of it all. Everything feels so chaotic and I misplace everything. less stuff means less stuff to lose, less hiding places for my (insert whatever important item I am currently missing) and less stuff to clean. I found myself reading a section and then pondering. thinking, visualizing. it’s pulling together and I’m optimistic. Tomorrow is the last day in Zone 1: The Entrance, Front Porch and Dining Room. I worked in the entrance today. It’s amazing because I’ve already spent time in here since starting this project and still more items could be pulled out. some new but most was there during my last session. A large garbage bag sits ready to go outside to the trash. coats hung back up and plastic shopping bags contained for the upcoming yard sale. a handful of items placed in the yardsale tote. There are things my husband will have to sort through – the tote of tools, some outside stuff. Here are a few items that I’m undecided about: 1. the punch bowl with cups. I brought this home months ago and we haven’t even taken it out of the box. It was a freebie and I really wanted it. It sits on the shelf. 2. the hummingbird feeder. We’ve filled it twice. I’m too short to put it up or take it down. It wasn’t washed and has some funkiness to it. When we used it hummingbirds and bees frequented often which we could admire from our kitchen window. Even though we aren’t outdoorsy people our camping gear is stored here up on the shelf but we’ve pared down to a reasonable amount of items. 3 sleeping bags, an air mattress, a tent and a lantern. When we travel all but the tent are used so I don’t feel so bad holding on to these items. Everything else is already gone. Most of my daughter’s outdoor items were already moved to the shed so only a handful remain in this space. Our laundry supplies are also housed here as it’s our laundry room as well. It’s better. Tomorrow I’ll sweep, mop and clean to finish off this room. I also spent some time in the kitchen because the dining area is always kept up. Miss Minimalist helped so much in this area as did my husband. cookie cutters purged by half, the extra crock pot will be leaving, our 4 wine glasses as well (this includes our wedding glasses – pictures first before the purge). The blender too will be leaving. It’s used about twice a year and I hate to clean it. Kitchen drawers emptied and filled with only what we use. The bottle of wine I didn’t like? down the drain. the wine glass charms? gone. 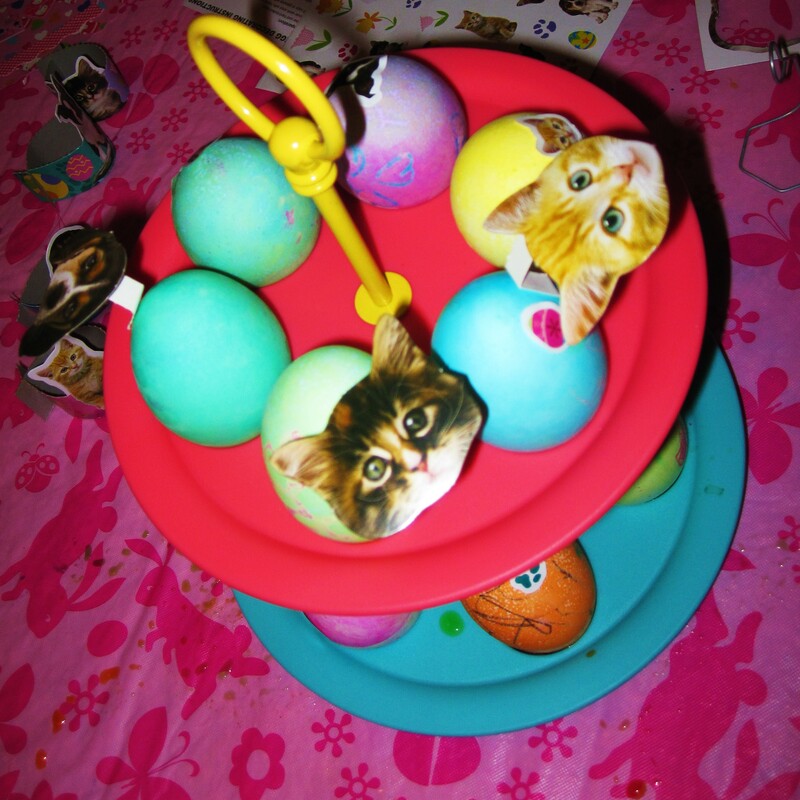 Our eggs are dyed – all 18. 20 fingers dyed as well. part of the tablecloth, a paw on the dog and some small spots on the rug. My daughter got up and banged into the table spilling some dye. She tripped over the dog while sitting back down and spilled quite a bit more. normally at this point I’d be freaking out, losing my patience and smile would be gone. I guess today is different. Even my husband noticed a difference. Her hand shortly in – much more colorful now. My head is hurting and my hands are shaking but I’m smiling as I type this. Today felt like a break through day for me! A wonderfully, marvelous break through. The first occured this morning – I was in a small room with an obviously disgruntled individual and I didn’t allow their mood to bring down mine. I tend to be an emotional sponge. Negativity especially likes to leech off of everyone in a room. I didn’t allow it in and helped to block it from the children as well. So by the end of this visit my mood wasn’t tainted and my spirit wasn’t dragged down. Second point to cheer about – I touched something DIRTY. I started to sweat, my heart was palapating. My hands were shaking soooo bad. 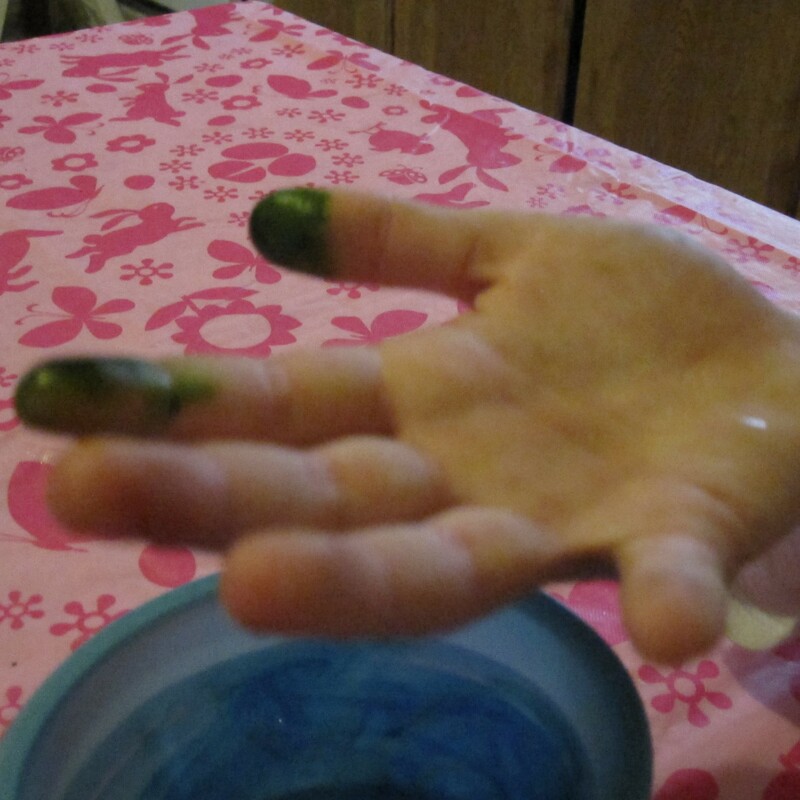 My head was screaming – SCRUB THOSE HANDS! DROP EVERYTHING AND RUN TO THE NEAREST SINK! NOW!!!!!!!!!!!!!!!!!!!!!!!! The staff with me knew something was wrong. She asked me if I needed to step out and wash my hands but I said, “it’ll be okay.” There were baby wipes in the bag (definately not a substitute for a suitable hand scrubbing), hands shaking so fiercely that I fumbled multiple times trying to take out one wipe to give my hands a quick swipe. I firmly told myself that I would get through this. and I did. I survived and the world did not come to an end. The OCD did not beat me. Second triumph for the day – home visit with a truely delightful family. 13 children ranging from 1-13. I brought a memory match game to play with the younger children. we dumped the pieces on the floor and they were quickly scattered to the four corners of the room and wandered further into the dining room. Normally at this point I’d be sweating and quickly gathering up the pieces (and counting them twice to ensure no piece was lost). a piece went into a mouth, the box was stepped on but still we played and I smiled and it wasn’t fake. 84 eggs boiling on the stovetop. 6 eggs per child with 6 extra just in case. styrofoam cups full of dye, water and vinegar. little hands, unsteady hands sitting around the table. cups abound. still i smiled. a little one smooshed a egg in her hand – pieces crumbling everywhere. a cup knocked over – pink water seeping down to the floor and spreading over the table. hands colored blue, green, pink and orange. my head was aching but I pushed through. I calmly and genuinely helped and went in turn complimenting the young ones on their marvelous eggs. no criticisms came close to my tongue – no corrections to be made. It was a wonderful experience that I was lucky to share with a group of fantastic children. the younger ones began to cry. it was close to lunch time – to nap time. Crying babies send me running. – it’s the noise, the tears, the snot. usually it’s my cue to go. “what can I do to help?” came out of my mouth without a second thought. snuggling close, rocking gently, rubbing back and feet till the smiles came back on the little one’s face. I held many of the children today – watching tv, rocking, gentle talking to them. there were dirty faces, runny noses and maybe even a dirty diaper. i didn’t reach for the hand sanitizer or run for the sink or the door. I left feeling happy and fortunate that I work with such wonderful foster parents. They do a job so hard that I could only imagine what it’d be like. fostering is a 24-hour, 7 day a week job that is underpaid and under appreciated. I work with severely traumatized children and it’s not easy to be a foster parent but we are blessed with some of the best ones out there. I love my job and that is why managing my ADHD and OCD is so important. My children need me to be on my game. They need me to play with them and comfort them. I need to take care of myself so I can take care of them and the foster parents. I need to be a good role model for my birth parents. and I need enough left over to take care of my own – my beautiful (special needs) daughter and my husband. Today I felt like a success and I didn’t have to fake it. I left proud – compulsions were running high but not forcing me to run away. I went out to the vehicle, put a squirt on sanitizer on my hands and did the motions. held off counting the game pieces. i drove away. I must admit. I could only make it 14 miles before I pulled over and counted and sorted the game. failure? no – because that is amazing that i could put if off for that long. maybe next time it’ll be 30 and then maybe not at all. pulled back out onto the road – anxiety soaring high – starting frantically counting to 100. warding off some DOOM and DREAD. I made myself stop – slowing breathed in DEEP and FULL. the calming deep stomach breaths and counted to 10. 10 deep breaths. anxiety dropping. still want to count, still shaking. called my mom – want to go all crazy and ramble about my nerves. instead, i asked her how her day was going and talked about her. Right now – I’m boiling eggs – 18 total. going to make a delightful mess with my own daughter. no corrections, no criticism, no fears. I can do this! The OCD will not beat me down! The OCD will not rule my life and take away my joy! Yard sales require organization, goal setting, people skills and the ability to price things accurately. 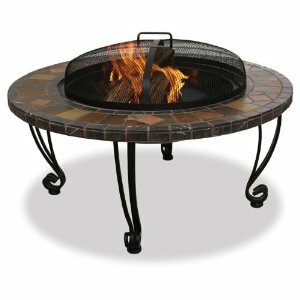 which means, with my ADHD, I’m scrambling around even after the sale has started pricing things and setting things up. It usually means I’ve forgotten to place the ad in the paper until 3 days before. It usually means I underestimate the time it takes to sort and decide what to sell and what to keep. It also means I question and doubt every price I put on items. To put it mildly I despise yard sales. Why are we planning to have one? Because it works. It works for the three of us to part with our STUFF. I’ve learned that there are BIG TICKET items we want and if I dangle these items in front of our faces and say, “Let’s have a yard sale!” that it gets done. Maybe having the pictures handy will make it easier to motivate. 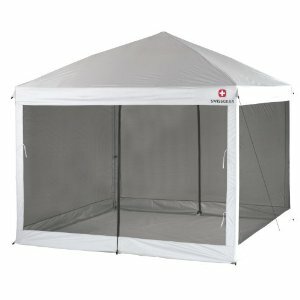 The first part of my yard sale plan – the ADHD friendly plan. Here is how I’m going to prepare for the yard sale this year. The following list is the zones as determined by Fly Lady. I’m going to tackle each zone in turn searching for yard sale items. As I find them I’ll clean and price them then put it out in the shed for the yard sale. (at the very least I’ll find them and put them outside.) We’ve been talking about having the yard sale in May so if I do a little bit each week and then have my mom help me with the family room I might just be ready. My husband and I used to relax and unwind together while drinking herbal tea. Country Peach Passion, camomile, sleepy time and more. Lately we’ve taken this habit back up and bought a selection of teas to add to our shelf. Camomile remains my alltime favorite. 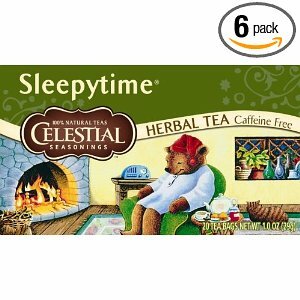 I simply adore Celestial Seasonings Sleeptime tea. It’s a beautiful blend of camomile, spearmint and other wonderfully pleasant flavors. I sit with the mug warming my hands, the smell soothing my soul and the taste refreshing my spirit. It is my happy tea. 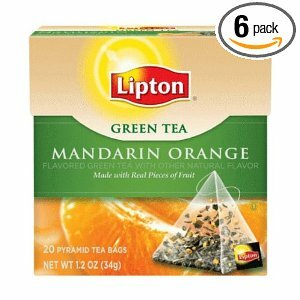 One of the teas we bought was Lipton’s Mandarin Orange flavored Green Tea. I’m totally thinking, “YUM”. I love mandarin oranges, i love tea so this is a win win purchase. Ingredients Green Tea, Dried Fruit Pieces (Apricot, Peach, Mango), Natural Flavors. No where is on the ingredients listing is mandarin oranges – must be part of the natural flavors. how disappointing. There are plenty of quotes about happiness and about tea but here is one of my favorites. “Come, let us have some tea and continue to talk about happy things.” – Chaim Potok.